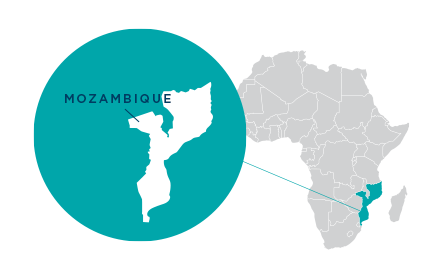 According to the World Bank, only 6 percent of the Mozambique workforce reaches the level of vocational or tertiary education. This causes a large employment recruitment gap for the agriculture sector, which drives many firms to bring in foreign labor. To address a critical need for locally trained staff, the TVET project establishes the Manica Agribusiness Center (MAC), a vocational training institute at the Instituto Superior Politécnica de Manica (ISPM) facilities in Manica province, Mozambique. As well as providing technical, vocational and professional training to the agricultural sector – primarily agribusinesses in Manica province, but also to other stakeholders throughout the country such as staff from NGOs, government and other public sector organizations – the center will also serve a critical role as a meeting, demonstration and information sharing point for the growing number of agribusinesses in the province. In order to ensure that courses deliver by the center are in line with market demands, all of the courses are designed and delivered together with private sector partners, such as John Deere/Lonagro (tractor operator courses), Yara Fertilizers (crop nutrition courses), Terragro (drip irrigation systems), Phoenix Seeds (seed marketing for agrodealers) in addition to a range of other technical courses such as basic mechanical skills, pump maintenance, Climate Smart Agriculture, pest management (e.g. the Fall Army Worm) and others. Wherever possible, course design and delivery will also take place in close collaboration with the public sector, ensuring that courses are aligned with government institutions and other NGOs. Unlike most existing vocational and professional training institutes in Mozambique, TVET focuses on short, technical courses that are directly linked to private sector demand (at present, most colleges offer longer courses of around 6 months or more). This allows the private sector and other clients to release their staff for short periods of time in order to be trained in specific skills and competencies, in addition to ensuring that the college’s fee structure is adequately placed for the market. Engaging the private sector as a key player in curricula development and course delivery ensures that students are trained in the use of up-to-date techniques, technologies, equipment and inputs, but it also serves as a marketing tool for private sector partners. 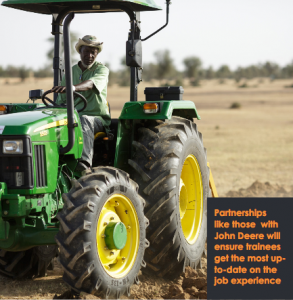 For instance, Lonagro Mozambique (agents for John Deere) have committed to supplying the college with an equipment “starter kit” consisting of a 45 HP tractor, direct seeder, rip on row package, trailer and other associated equipment. The project is also ensuring that public stakeholders have access to high quality training. With course subsides, staff from the district level Mechanization Parks, local SDAE (District Services for Economic Activities), and other government departments can benefit from courses. Manica province’s good agronomic conditions, proximity to Zimbabwe and strategic location on the Beira Corridor has encouraged many agribusinesses to invest in the province. However, as yet no forum exists for these actors to communicate and collaborate. The CAM will further drive the agricultural sector in the province by providing agribusinesses with a much needed focal point not just for training their staff in market driven skills and techniques but also for demonstrating their products and services and sharing information with one another. As a practical teaching tool for the college’s vocational course, in addition to the ISPM’s existing agronomy degrees, the Model Farm will serve as a demonstration site. The primary value chain training includes techniques working with high-value crops such as irrigated seed production, baby corn, tomatoes and other vegetables. These value chains not only represent higher income for the farm, but also provide practical ways to provide training on a wide range of techniques for students. The Model Farm will also receive the ISPM’s agronomy students as part of organized internships, who under the supervision of the Model Farm’s Farm Manager and Assistant will be responsible for the farm operations. 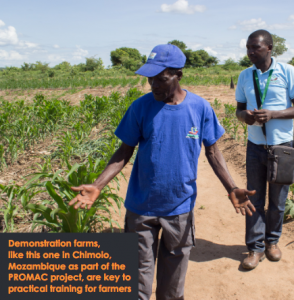 Providing a hands-on, practical, private sector focused curriculum that is accessible for working professionals will address the critical need for agriculture training in Mozambique. Supporting the local agribusiness sector’s goal to hire locally and improve the knowledge and skills of the local agriculture labor force as well as government agriculture partners, the TVET institute will have ripple effects through extension networks and the entire agriculture sector.